The PuttOUT Putting Mat is a tool that has been designed to provide a reliable base for practicing the most underrated part of anyone’s game: putting. Available in two colours (green and grey) and printed with markings up to 6-feet, alignment lines and pace targets, the PuttOUT Putting Mat intends to give you the opportunity to practice every aspect of your putting. Reading ten on the stimpmeter, the PuttOUT Putting Mat is a chance to practice on a medium-to-fast paced green away from the course, ready to take on any speeds throughout the season. It comes in a protective, dense cardboard cylinder, the mat stay tightly pressed and crease-free. Paired with a low-profile drawstring carry bag, this is the perfect station to practice putting anywhere, any time. With extra-thick TPR rubber backing, the mat rolls flat straight out of the packaging, giving a consistently smooth and reliable roll, allowing you to focus on making your stroke the best it can be. The mat looks great and you can tell a lot of thought has gone into the design both from a putting perspective but also in the packaging meaning it rolls out flat every time. Due to the design you get a true roll on every putt, no bobbles from creases makes this a great training aid. The pace of the matt is also very good in that it's not mega fast but also not like putting on carpet and prepares you for what I would say is the average putting speed to be found at golf clubs. The mat with its true roll and speed will mean you can practice whenever you want and get great and instant feedback of your putting stroke. I feel this would be a terrific addition to any golfers kit or even for teaching professionals giving lessons indoor. Easy to use giving great/instant feedback. 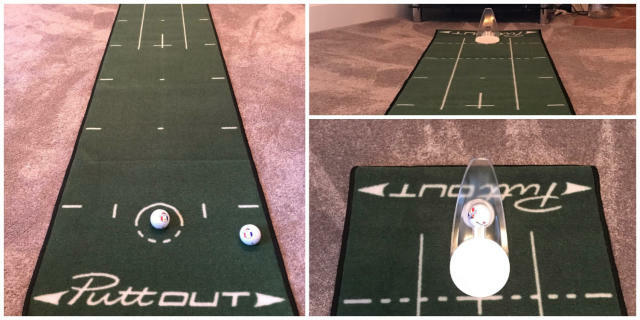 You can practice any length of putt up to six-feet from the comfort of your home. At £69.99 some may see this as an expensive item, but if you think you get to putt any time you want it's not too steep. I think this is a great training aid and along with the PuttOut (Review) gives you the chance to putt whenever you want but also with some added pressure to achieve the perfect putt. Even without the PuttOut you can practice speed and take on some skills challenges. For more information, visit https://www.puttout.golf/.